I grew up watching the news. Every night, in my parents’ home, and my grandparents’, the evening news was on: thirty minutes of network national news, followed by the local news. It was a window into worlds unknown, and we watched and believed what we saw. Now, decades later, awash in information overload, fake news, 24 hour-never-ending coverage of everything, and opinion and attitude served up with facts, I’m exhausted, skeptical, and tuned out. I’ve chosen to control what I feed on, and the voices and influences I allow in my life. Frankly, when I do catch an occasional news show, these days it’s often just painful. Images of violence, conflict, anger, disaster, or scenes of hosts and guests arguing fill the screen. Rather than feeling informed, I mostly feel insulted or assaulted. What passes as news frequently seems little more than the most outrageous story that’s likely to attract viewers. The public is the audience and the market, and we fill up on celebrity watching and feuding. Or substitute politicians for celebrities…pretty much the same fare. Scandals and the most recent round of extreme behavior give everyone something to talk about. Social media plays a part as well. If you escape the blow-by-blow in person, you’re sure to see the latest stories and scandals rehashed on your Facebook page. Try these ideas if you find yourself needing a break from the news cycle, or TV in general. Instead of watching TV, choose an online option or two for your news sources. You can access all major newspapers and news channels, as well as aggregate sites that pull articles and videos from a variety of resources. When you access news online, you can choose to read or view just what interests you, rather than being inundated with stories and images you don’t want, or an endless cycle of the same material. By accessing news online rather than through TV, you control the timing of your access, and you avoid the endless news cycle which is often just a repeat of the same information from program to program. Consider how you can make a difference. Instead of being a passive watcher, think about ways to be responsive…to disasters, to political issues, to environmental questions. There are so many ways we can help others, and speak out. Most people will find opportunities to act in their local communities, but with social media, anyone can reach anyone else, anywhere. If you’re viewing TV, you’re likely not doing other things. You’re likely not interacting with your family, or making productive use of your time. Take back some of the time you spend now in front of the screen (watching news or anything else) and get outside, do something with your kids, volunteer, read something inspiring, visit a friend in person…the list is endless! Get creative. TV is designed to consume. We consume the programming, and the programming consumes us: our time, our energy, and our thoughts. Turn it off and find your creative energies. When you’re consuming, you’re not creating. Try limiting your intake, and upping your output. You can express yourself in many ways. What’s your favorite way to be creative? Enjoy the sounds of silence when the TV is off. Or enjoy music, or an audio book. You don’t have to watch TV to have something interesting, energizing, or informative in your life. 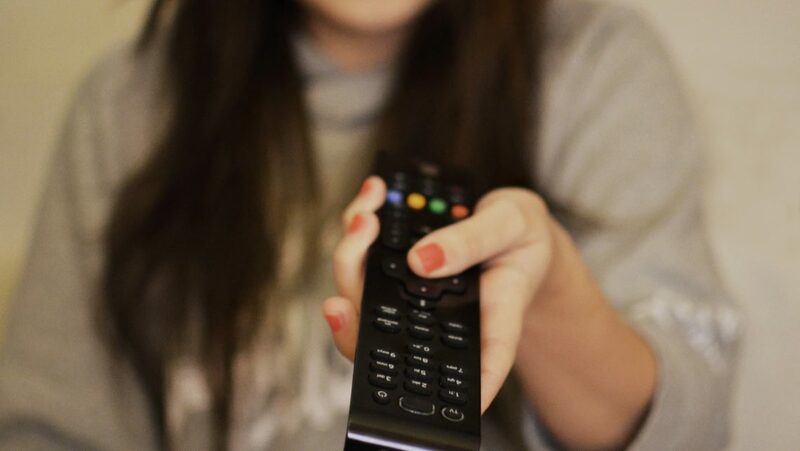 If you’re in the habit of letting the TV stay on all day, practice turning it off. See what your life is like when you remove the constant noise and intrusion. When you choose to tune in to a TV program, be selective. Turn off the TV when the program you watched is over. Don’t fall victim to watching whatever comes on next. Think about where you watch TV. If you have a TV in your bedroom or kitchen, consider removing that access. Many studies have shown that watching TV in your bedroom has a negative impact on your sleep, your health, even your relationships. I found that when I had a kitchen TV it was too easy to have it on all the time. Make your TV option a little inconvenient to help you be more intentional about viewing. Try a 30 day challenge. Change your viewing habits for 30 days. See what you find to do instead of watching TV. If you find yourself feeling sad, angry, or just overwhelmed from TV barrage, take control. It may be hard at first to resist clicking the remote, or to appreciate the silence if you’re used to TV as background noise. But do it and see how you feel. This is the important thing: take charge of your life, and the forces you allow to influence you. Be especially protective of your time. You’ll be happier and more productive, I promise!